Imagery and GIS have a symbiotic relationship: Imagery is the foundation of most GIS datasets, and GIS can be used to more effectively manage and derive information from imagery. Imagery and GIS: Best Practices for Extracting Information from Imagery provides GIS users with the knowledge to make informed decisions about working and processing imagery; extracting information from it; and assessing, publishing, and serving imagery datasets. This book is especially valuable given the recent significant improvements in the availability, cost, and spectral and spatial resolution of remotely sensed data and the proliferation of remote-sensing devices. For civilian uses, the availability of remotely sensed data has exploded owing to the evolution of sensors, the development of smaller and more agile platforms such as drones, the improved positional accuracy of GPS, and decreases in the cost of storage on disk and in the cloud. Imagery and GIS together support an increasing number of vital applications for environmental management, humanitarian aid, public safety, climate monitoring, transportation, agriculture, and many other industries. These applications will only expand in scope and importance in the future. The book’s first section introduces the fundamental concepts of imagery. It covers how remotely sensed data is collected and the characteristics of that data. With this foundation, the final chapter of the section explains how to select the most appropriate imagery for an application. The other three sections address in very practical terms how to use imagery, extract information from it, and manage image and GIS data. The topics covered include digital elevation models, image classification, change analysis, and accuracy assessment. Numerous screen captures, diagrams, charts, and graphs illustrate the concepts discussed, and a glossary of terms and lists of acronyms and references enhance comprehension. Imagery and GIS Web App, an Esri Story Map app developed to provide current information on the use of and availability of high to moderate resolution data from remote sensing satellites in service can be accessed at esriurl.com/IGT42. 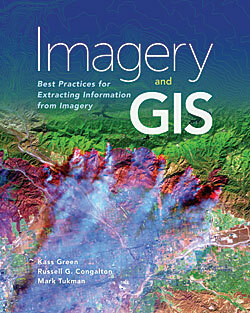 The authors have decades of experience working with imagery and GIS in research, real-world applications, and teaching. Kass Green’s career in remote sensing and GIS spans more than 30 years. She has worked for nongovernmental organizations (NGOs), public agencies, and private companies throughout the world. This work has included innovative research, multiscale and multisensor mapping projects; strategic planning; policy analysis; and decision support tools development. Dr. Russell G. Congalton, a professor of remote sensing and GIS at the University of New Hampshire, has more than 35 years of experience teaching and researching geospatial technologies and working for private industry, federal and state agencies, and academia. Mark Tukman, the owner of Tukman Geospatial in Santa Rosa, California, has more than 20 years’ experience using imagery and other datasets to help public and private organizations map land cover, make decisions using spatial data, and support land conservation efforts. Esri Press, 2017, 435 pp., ISBN: 9781589484894.